Morphine is available in several forms and can be injected or taken orally—both in liquid or pill form. The end result of how Morphine works depends on the way it is taken. Liquid Morphine works rather quickly—in as little as 15 minutes, and up to 4 hours. Patients taking the liquid form of Morphine may chase it with other liquids to mask the bitterness of the taste. The pill form works in a rapid release form; it works fast and lasts for hours. Pills can be crushed and taken with food, or through a nasogastric tube. The injection form goes into someone’s skin, in a major vein or injected into one’s fatty tissue. Once the liquid enters the bloodstream, the chemicals are released through the body. Due to the addictive properties of Morphine, expectant mothers should use extreme caution. Additionally, people taking other drugs should exercise extreme caution when taking Morphine. Morphine overdose symptoms can mimic side effect symptoms like irregular heartbeat, nausea, fatigue, and shallow breathing. If someone using Morphine experiences these symptoms, call a treatment expert for help. To avoid these symptoms, individuals may continue to use Morphine. 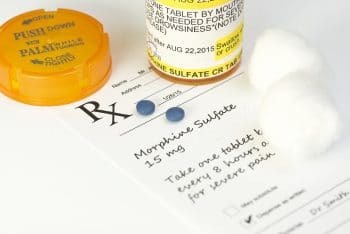 The continued use of Morphine can develop into a substance use disorder, which can spiral into the use of stronger, but more dangerous Opioids. At this point, an addiction is likely born. Morphine detox requires medication to cleanse the body of Morphine’s addictive properties. Through the process of detox, individuals battling a morphine use disorder endure less painful physical symptoms of withdrawal than they would otherwise. This process is vital in transforming a substance use disorder into sobriety. Best done in a medical facility under the help of a medical professional, detox is the safest and most successful way to begin morphine addiction treatment. Doctors may use the tapering technique, which allows the patient to be weaned from Morphine gradually. The patient receives medications like Naltrexone and Buprenorphine (Suboxone), which block Opioids from effectively working. In addition to these drugs, patients can benefit from a wide variety of other methods, including biofeedback therapy, counseling, meditation and peer groups for wellness. People in a facility can opt for inpatient or outpatient treatment options. Inpatient treatment offers patients hands-on treatment in a residential setting. Outpatient treatment is ideal for patients juggling many commitments but who need medication and 12-Step facilitated treatment. Faith-based treatments are provided at some facilities, as well as experimental therapies. Morphine is highly addictive, but getting help is key in living a life of wellness. If you or someone dear to you battles an Opioid use disorder, hope is not lost. Take the first step in gaining freedom from addiction with a call. Contacting a dedicated treatment expert can help put individuals struggling with Opioid abuse on a path of sobriety. Future patients have the option of gathering information and discussing concerns with a specialist. Call today and get your life back on track. Krystina Murray has received a B.A. in English at Georgia State University, has over 5 years of professional writing and editing experience, and over 15 years of overall writing experience. She enjoys traveling, fitness, crafting, and spreading awareness of addiction recovery to help people transform their lives. Get the latest on Opioids and recovery. The information provided by Opioid Help is not a substitute for professional medical advice.